Just as general advice, all your SMS marketing campaigns should be targeted, qualified, and offer an extreme amount of value. No matter what type of business you own, always focus on exclusive and qualified promotions. SMS marketing has become a go to growth solution for restaurant owners nationwide. 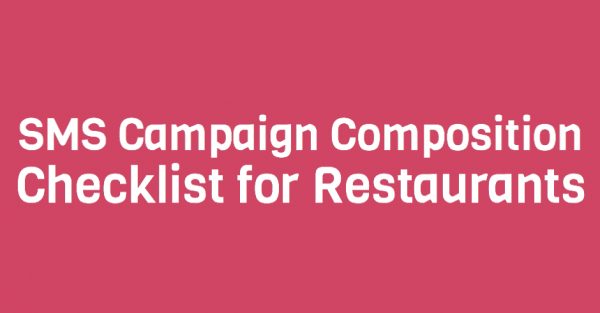 When composing your first campaign, run through this checklist, written specifically for business owners working in the food service industry. 1. First things first, are you sending out an actual offer? Whenever possible, stay away from general announcements, as this devalues the purpose and effectiveness of your SMS marketing list. For example, if you’re closing in the month of January for renovations, send out a message that looks something like this. We’re closing in January for renovations, but reopen for business on February 1! Stop in and show this text on the 1st to receive one free dessert, on us. In addition to announcing your new schedule, you’re rewarding subscribers with an exclusive offer. 2. Can this offer be instantly redeemed? Ideally, we recommend restaurants fire out “day of” offers. Don’t send out a dinner special on Thursday at 5PM, but only allow it to be redeemed on Friday. This will confuse subscribers, and result in low offer redemption. Make sure your offers, for the most part, can be instantly redeemed. This will increase your check totals, and make for the best SMS marketing experience. 3. Are you discounting/giving away a popular menu item? Don’t make your deals too specific. For example, instead of just discounting Shrimp Alfredo, fire out a mobile coupon for all pasta dishes. The broader the offer, the better chance you have at experiencing high redemption rates. Ready to grow your restaurant business using mobile communication? Partner up with top SMS marketing provider, Slicktext.com. Give us a call at 1.800.688.6290 to sign up for your free plan.